Toyota unveiled the all-new 2019 RAV4 and RAV4 Hybrid in New York today. This new RAV4 is built on a completely different platform, has new engines, new safety technology, and a fresh new look. The new RAV4 will come in various themes. The Adventure has high-mounted roof rails for outdoor adventures. The Hybrid and conventional RAV4s will also have slightly different front ends depending on trim. In many ways, the new front end looks similar to the top-selling Tacoma pickup. Two-tone XSE and Hybrid trims will impress with sophisticated styling. The new RAV4 will be built upon Toyota's New Global Architecture (TNGA). This new, modern platform will enable the RAV4 to score higher on key IIHS safety tests, including the important small frontal overlap test that the RAV4 has never scored higher than Poor on. In addition, the new RAV4 will have Toyota's second-generation Safety Sense technology. This will include not just standard automatic emergency braking, but steering assist and full-speed adaptive cruise control. Look for the new RAV4 to earn a Top Safety Pick Plus rating. Both a new 2.5-liter four-cylinder with an 8-speed automatic and a new generation 2.5-liter hybrid system will enable better fuel economy while at the same time delivering more power and torque. 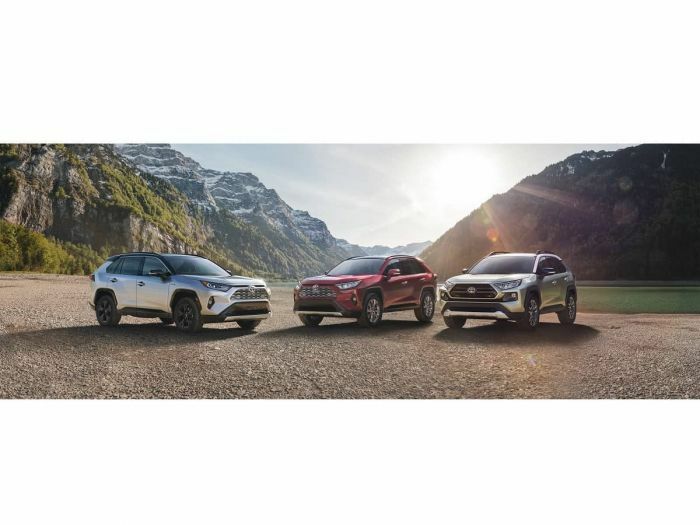 RAV4 will now offer three different AWD systems. The novel two-motor hybrid AWD system still has the rear motor to drive just the rear wheels, but can now deliver significantly more torque. Torque-vectoring and the ability to disconnect the rear wheel in some situations will improve handling, off-road situations, and improve fuel economy. Prices and details fuel economy and power specifications will soon follow. We will update our report when they become available. Expect the 2019 model year RAV4 to appear in dealerships later this year. So the title said pictures and all you have is the lead in photo a a distant shot of the line up. boo.